2853402 LEGO Star Wars: The Visual Dictionary is a book in the Star Wars Visual Dictionary series written by Simon Beecroft. It explains and explores the LEGO Star Wars sets that have appeared over the years that LEGO and Star Wars have been in partnership. The first pages show every official LEGO set that has appeared over the years, and what Episode they are from, starting from 1999 all the way up to 2009. Then it explains the details of sets from Episode I, II, III, the Original Trilogy and the Clone Wars. At the end of the book is an exclusive interview with a LEGO employee and Fan created sets. With this set comes an exclusive minifigure, officially known as Celebration Luke. 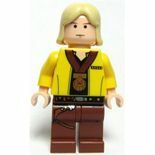 It is a standard Luke Skywalker minifigure (with long hair), with the clothes Luke wore along with his medal at the end of the Yavin IV celebration in the final scene of A New Hope. The concept was that Luke was celebrating the ten year partnership between Star Wars and LEGO. The designer team wanted to make the minifigure exclusive, so they picked a minifigure that would never have been released. This minifigure would have been bundled with the Yavin Base set, but the set was never released. Two variations of this figure have been released, one with the old Luke Skywalker head, with a plain expression and no pupils, and the other with a newer head with pupils and a happy expression. 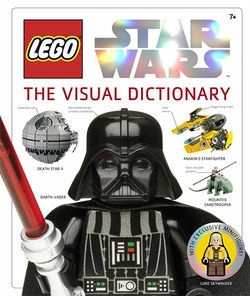 This is the same set as 2853508 LEGO Star Wars: The Visual Dictionary. Prototype Layout. Differences from final; Darth Vader is damaged, background is different and Celebration Luke is not yet revealed. Brickmaster City | Calling All Cars! | Escape from LEGO City! | Fight This Fire! | Heroes! | LEGO City Ultimate Sticker Collection | Work This Farm! Facts about "2853402 LEGO Star Wars: The Visual Dictionary"
This page was last edited on 21 September 2016, at 07:56.